Presented By: Golden Landmarks Association, Inc.
Golden Landmarks Association (GLA) is proud to announce our Living Landmark honorees for 2019. GLA (www.goldenlandmarks.com) has selected two individuals and one organization as this year’s recipients; each has a long history of commitment to Golden. GLA is hosting its eighteenth Living Landmarks Dinner this year. The event recognizes individuals and organizations whose dedication to Golden has had a positive impact on the City and greater community. This year Golden Landmarks will recognize Dave Powers, the Golden Lions Club and Kathy & Kevin O’Connor. We are proud to name Dave Powers as a 2019 Living Landmark. In 1988, after 30 years of professional fundraising in the East, Dave moved the family to Golden, Colorado where he continued his lifelong commitment to educational and non-profit fundraising and leadership. In Golden alone, Dave has directed his energies to the Colorado School of Mines, Foothills Art Center, Golden Visitors Center, Golden Civic Foundation and the Clear Creek History Park. In his “free-time” Dave pursues his passions of western history, photography and music. The Golden Lions Club was chartered with Lions International in December 1942. For over 75 years they have served Golden, Colorado and the surrounding communities. The service the Lions Organization provides to the community includes annual scholarships for three students at Golden High School, participation in the Backpack Program, the “Kidsight” eye testing program, the “Recycle for Sight” eyeglass program and organizing and hosting the annual 4th of July community celebration in Golden’s Lions Park, just to name a few. Kathy and Kevin O’Connor have been Jefferson County residents for 41 years, half of which have been in Golden. They have volunteered thousands of hours with many of Golden's cultural and service organizations, including the Jefferson Symphony Orchestra where they both served on the Board for five years. Kevin and Kathy have also been involved with projects for Family Tree, the Golden History Museums' Astor House and Clear Creek History Park sites, the Golden Lions Club and Golden High School. 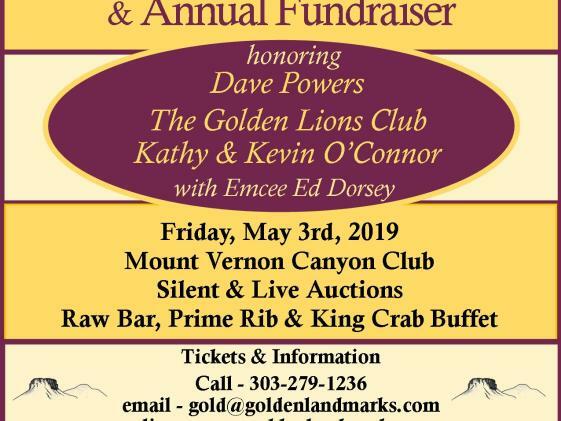 Honorees will be recognized Friday, May 3rd, in the Canyon Room at Mount Vernon Canyon Club in Golden, Colorado. 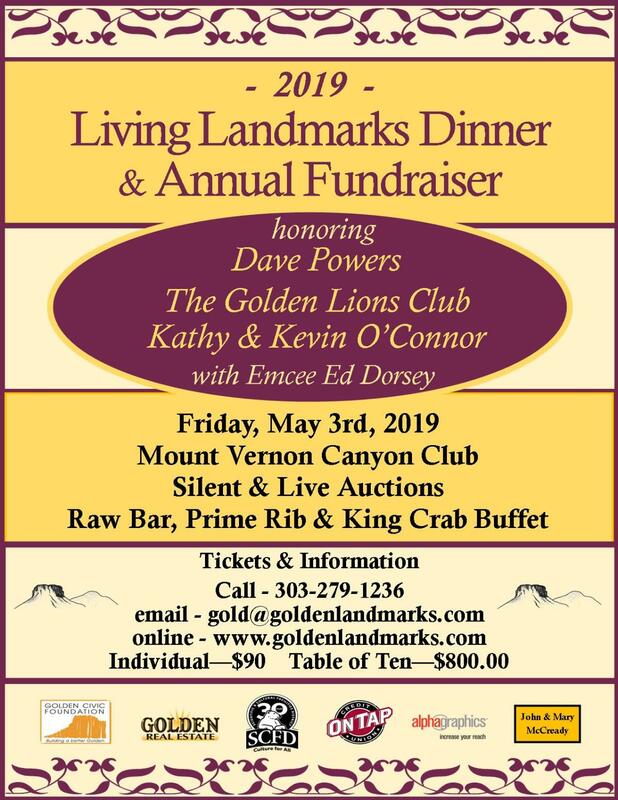 For more information or to purchase tickets, please view us at www.goldenlandmarks.com and look for the Living Landmarks tab, OR call us at 303-279-1236 or email us at gold@goldenlandmarks.com. About Golden Landmarks Association: As the second oldest historic preservation organization in Colorado and a qualified 501(c)3 not-for-profit, GLA is dedicated to preserving Golden’s history and educating both residents and visitors about the Golden area. Our efforts to preserve Golden’s rich history have helped achieve the restoration and preservation of many local landmarks. These include the Astor House Museum, Burgess House and buildings within Golden’s Clear Creek History Park. GLA was also instrumental in the establishment of Golden’s three current historic districts and GLA continues its collaboration with Golden’s Historic Preservation Board and private citizens towards the designation of future historic districts. Our current projects include the restoration of the Brickyard House, curating the Ronzio photographic collection and the Pete Morrison collection.